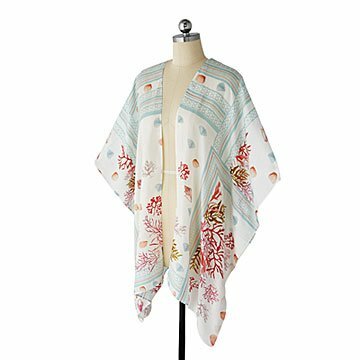 So light and airy it almost floats, this silk kimono has an exquisite undersea-themed watercolor print. So light and airy it practically floats, this three-quarter length open-front kimono is an irresistible blend of sophisticated luxury and casual elegance. The soft woven silk wrapper features exquisite, vividly colored watercolor seashells and seaweed between pale pastel border patterns. Slip it on over dresses, long-sleeved shirts, and sweaters, and go.... anywhere. Simple and stylish, it's an exceptional gift for homebodies who love to lounge and lovers of the social surf. Makes a sweet honeymoon surprise, too. The one thing we don't love? Sometimes you have to take it off. Made in India. Shivani Mehrotra and Yatin Narula are proud of their Indian heritage. The creative duo brings the world a collection of gorgeous accessories—from shawls and scarves to ponchos and kimonos—in mouthwatering colors, all inspired by and manufactured in their home country. Mehrotra, a Los Angeles resident, and Narula, currently living in New Delhi, are masters of making the finest fabrics and silkiest threads with superbly detailed craftsmanship. Adept at understanding the modern day need for fashion and functionality, the designers not only make accessories to spruce up your wardrobe, but to enliven your home as well.